Elevated between 4101 ft and 10663 ft, the Ski Resort is among the 15 highest elevated Ski Resorts in France. The vertical drop from summit to base is 6562 ft. The average difference in altitude between base and summit of Ski Resorts in France is 2848 ft. Most runs are therefore relatively long. La Plagne is among the 10 best rated Ski Resorts in France. Season starts on Dec 15 and ends on Apr 27 (133 days). Average season duration in France is 118 days. Average snow depth during the season (Dec 15 to Apr 27) is 91 " at summit elevation and 11 " at base elevation. Snow coverage is usually best during March, offering an average snow depth of 107 " at summit elevation and 12 " at the base. Therefore La Plagne is among the 10 ski Resorts with best snow conditions in France. La Plagne features 62 sunny days on average per season. The average for all ski Resorts in France is 61 sunny days. April is the sunniest month with an average of 21 sunny days. Offering 140 miles of slopes and terrain, La Plagne is among the 10 largest Ski Resorts in France. Find everything that you could possibly ask for on the 225 kilometers (139,8 miles) skiable terrain in the ski resort La Plagne. There is more than enough terrain to satisfy all ability levels by featuring blue slopes, reds and expert only trails in form of black runs. 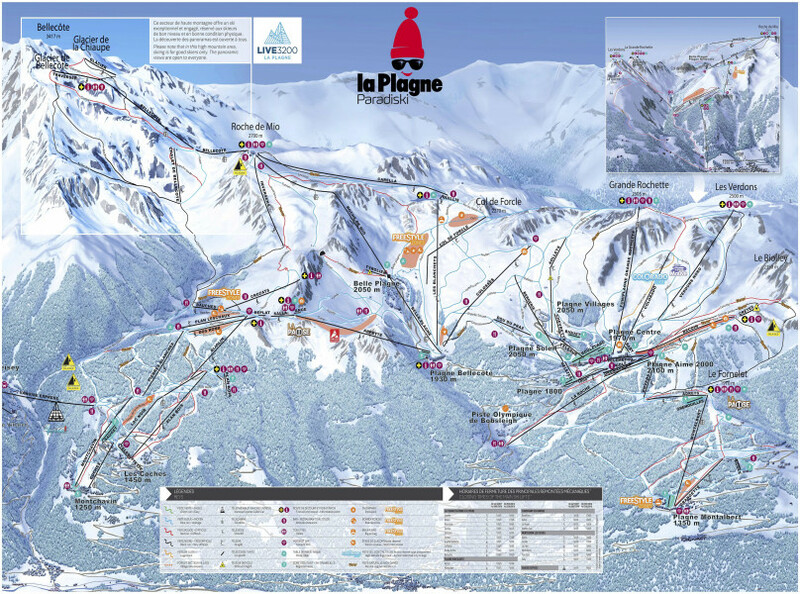 Moreover, La Plagne is part of the ski association Paradiski. That means you have access to a total of three ski resorts, two glaciers and impressive 425 kilometers (264 miles) of slopes. You can also find two terrain parks with a half-pipe and 153 kilometers (95 miles) of cross-country trails. Everywhere in the resort beginners have dedicated learning areas in form of blue runs. Altogether 139 kilometers (86,3 miles) await the ski novices to find their ski legs. There are plenty of runs where beginners can cruise along comfortably above Plagne Soleil and Plagne Bellecote. The blue runs at Bellecóte are often a good spot for beginners or blue folks too. Grab the gondola in Roche de Mio to find the blue trail up the mountain. In case the upcoming red trail is still too challenging you can just ride the gondola in order to get back to the base. Intermediate skiers don´t have to miss out, they have 59 kilometers (36,6 miles) to themselves. These are also everywhere throughout the resort. Definitely hit the trail from Bellecóte to Roche de Mio. Get up by taking the gondola. As you reached the top a beautiful red descend lies in front of you from where you have access to Belle Plagne. 27 kilometers (16,7 miles) are oriented to needs of skiers that love to challenge themselves and are black. You´ll find one that is on extreme skiers right by making your way from Bellecóte to Roche de Mio and turn onto the black run. Le Biolley will even please the most courageous skiers and snowboarders. Snowboarder and freeskiers find excellent features that will give them an adrenaline rush in the terrain park. Hit the half-pipe and three boarder-cross trails to have a blast. The countless freestyle elements help you to improve your skills and you can show off your tricks and moves to the audience standing around admiring the sportive winter athletes. Everywhere along the trails there are mid-mountain huts and bars that are beckoning you in for a break and leave you tempted to stop for a hot beverage or a tasty lunch break. As you leave the top station of the gondola at Bellecóte you´ll find a great restaurant that doesn´t only has extraordinary good food but also welcomes with a breathtaking panorama. La Grande Rochette on 2505 meters (8218 feet) above sea level also invites for a long break at lunch time. You can reach all towns by taking the individual slope that is descending into the valley. The longest is a red one starting in Les Verdons and ending in Champagny en Vanoise. This one is 6 kilometers (3,7 miles) long and you have to overcome a height difference of 1250 meters (4101 feet). The most challenging terrain is definitely the black trail Les étroits that will even make the most experienced skiers and boarders think twice. It has a vertical rise of 2350 meters (7710 feet) at the highest point and on the 2 kilometer long trail you have to overcome a height difference of 550 meters (1804 feet). Even just coming for the non-skiing activities is worth the trip. One of the highlights is a tour through the ice grotto. The 150 meter (492 feet) long grotto is home to countless ice sculptures. You can explore it from mid- December until the end of April, always between 10 am and 3 pm. Adrenaline junkies will love the thrill of the speed while rushing down the mountain on a bob. You can reach the speed of almost 80 km/h (49 m/h) and a maximum of four people fit into one bob. Kids have to be at least 14 years and 1,30 meter to experience the fun activity accompanied by their parents. Also nothing for the faint-hearted: a climbing tour on the ice tower. Beginners, advanced and experts- everyone finds climbing options with different gradient to suit every ability. If you prefer calmer after-skiing activities, you can look for the guided snow shoe hikes or husky sleigh rides. This way you can really take in the beauty of the winter landscape. A visit to La Plagne wouldn´t be complete without experiencing the town´s Apres-ski scene. Located right in the center of Champagny en Vanois is the Le Code Bar. Have one or the other drink and enjoy fantastic pizza. If you want a great dinner experience, look for the restaurant Le Boquetin in Champagny en Vanoise to enjoy the food you have always searched for. This is also a great place to come for mixed drinks and cocktails so you can easily get your night cap here. The french-alpine mix that most restaurants offer in the region is a real highlight for gourmets. The restaurant Le Boquetin in Champagny en Voise serves traditional Savoy cuisine by using only local ingredients. Additionally, you can recharge on the generous sun deck from where you have a great view. A great alternative for all traditional cooking lovers is the restaurant Les Rochers at the town entrance of Champgny en Vanoise. The comfy sun deck is the right environment to enjoy Savoy specialties. In the winter you can only come via Albertville-Moutiers because all the other passes are closed during this season. The mountain roads leading to the valley are easy accessible.